On October 29 and 30, India held its first Grand Prix in the history of the Formula One race at the brand new Buddh International Circuit, unanimously praised for its design. As Formula One group CEO Bernie Ecclestone put it, he was amazed at the state of the New-Delhi track built in a very short amount of time. But not only the track itself was spectacular, the results of the race were quite impressive too. Red Bull German pilot Sebastian Vettel made a unique achievement having won the so-called “Big Helmet”. The second and third places respectively were won by McLaren pilot Jenson Button and Ferrari driver Fernando Alonso. Unfortunately, for Vitaly Petrov, “Lotus-Renault” Russian pilot, the Indian Grand Prix wasn’t as memorable as it could be. Petrov had to serve a five-place grid penalty for the collision with Michael Shumacher, that’s why he had to start from the 16ht position despite having been 11th in the Saturday qualification. Russian pilot finished 11th at the Indian Grand-Prix, just a stone’s throw from the 8th or 9th positions he had expected to win. According to Vitaly Petrov, it’s his own fault that he didn’t score as high as his team intended. Speaking of his Grand Prix performance, Russian pilot says: “I made a good start but I made a mistake with clutch at an early pit-stop. This mistake interfered with our team’s plans, and I couldn’t outperform Sergio Perez and Paul di Resta”. Despite the difficulties Russian pilot came across at the Indian Grand Prix, Russia is optimistic as far as Formula One is concerned. 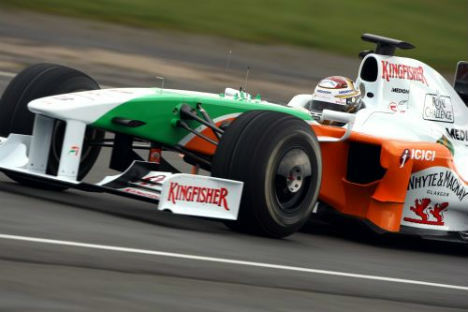 After Indian Buddh International Circuit got its first Formula One trial, Russia is planning to follow suit building its own Formula One track. There was no final agreement with Bernie Ecclestone yet, but according to him the building works are supposed to take place in Sochi.